Camping is pure bliss when you’re outdoors with nothing but the stars above your head and a mug of hot chocky in your hands, but winter can seriously curb your appetite for adventure if you aren’t equipped to handle the cold! Here are 10 ways to make winter travels a breeze. We most feel the cold at night, so your best bet is to keep close to the ground for warmth while sleeping. Sleeping pads keep you wonderfully toasty and cushion the hard ground. Keep an eye out for closed-cell foam pads, or all-season pads with an R-value (resistance to heat flow) of 5.0. Opt for a down sleeping bag with a high temperature rating for the cosiest winter night’s sleep. Down sleeping bags are great investments, but can be dearer than other styles. If you’ve already splurged on a summer sleeping bag, have a look at sleeping bag liners instead. Attach blinds to the side of your awning to buffer wind and rain, and to extend your living space in the winter months! A draught skirt blocks chilly gusts from flowing underneath your caravan, so that the heat inside doesn’t escape through the floor. Our hands are our most valuable tools, but they’re not much use to us when they’re cold! Heated gloves are great protection against frosty winds. For long daytrips, consider disposable hand warmers. Gas stoves are very handy in cold weather, because they can melt snow and provide hot food and drinks to warm you from the inside out! Gas models are most effective in winter, as biofuel stoves need dry wood to work. Compact gas heaters are a great way to warm up your living space, but remember to use them only in well-ventilated spaces that are fitted with a carbon monoxide alarm. If you regularly camp out on winter nights, spending the extra money on a specialised winter tent is a good idea. Built to withstand heavy snowfall and high winds, you’ll be very thankful for this level of shelter when you need it! Once you have a shiny ‘space’ blanket, also known as an emergency blanket, you’ll never want to travel without one. Attaching a thermal blanket to the roof of your caravan or tent also traps heat inside! Don’t wait until you’re cold to layer up. Trapping body heat underneath your winter outfit before you wander outside is the best way to keep warm. Invest in high-quality thermals and don’t forget to wear a beanie, as without one, most of your body heat escapes! Thaw out numb faces and frozen hands with a hot cup of tea or coffee. To avoid the disappointment of a lukewarm drink, invest in a top-tier thermos with extra insulation. 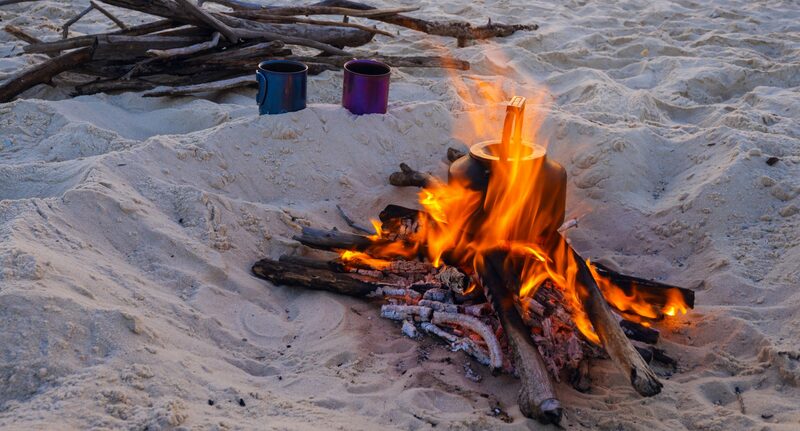 There’s nothing to motivate you on a long bushwalk through cold air like a steaming hot brew halfway through!